Urgent care in Pasadena doesn't mean you have to go to the emergency room; in fact, House Call Doctor Los Angeles is a service providing doctors on call who come to your home to treat you. Almost any medical predicament can be treated by Dr. Michael Farzam, the founder and CEO of House Call Dr. Los Angeles, providing the urgent care Pasadena residents didn't even know they could enjoy. What's more, Dr. Farzam will arrive at your Pasadena location (whether it's your home, hotel or worksite) to provide treatment usually within an hour or less. Appointments are thorough, as well, and you can expect one on one time with Dr. Farzam for as long as is necessary. Most appointments last 45 minutes, in comparison to the 15 minutes you can expect to see an actual doctor at the 24 hour health clinic. Getting the kind of care you need when you have a traumatic injury or an acute illness doesn't mean you have to go to the clinic for urgent care. 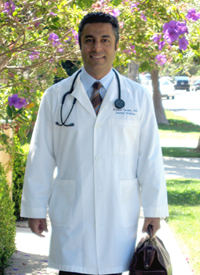 Pasadena residents are often delighted when they learn of Dr. Farzam's services, and that house call doctors even exist in the modern era. Not only do they exist, they are very thorough with follow up and building a strong doctor/patient relationship where communication is key. Dr. Farzam even carries common medications with him so he can dispense any medication you may need without having to go to the pharmacy when you feel unwell. Call House Call Doctor for urgent care in Pasadena at 310-849-7991!